Join Us on a Quest to Discover Our Roots . . .
Painting as a medium of expression is not new to human beings. From the graffiti of toddlers to the most sophisticated works of art, every soul seeks expression. The beginning of painting as a medium of expression goes down to the pre-historic era. The first artists were Stone Age people. Rock paintings of the pre historic era are mostly found deep in the caves, where natural light does not reach. Prehistoric rock paintings have been found in many parts of the world, including France, Spain and Italy. In India there are over 150 rock painting sites. Of these, the largest and the most spectacular one is located in the Vindhyan hills at Bhimbetka in Madhya Pradesh. 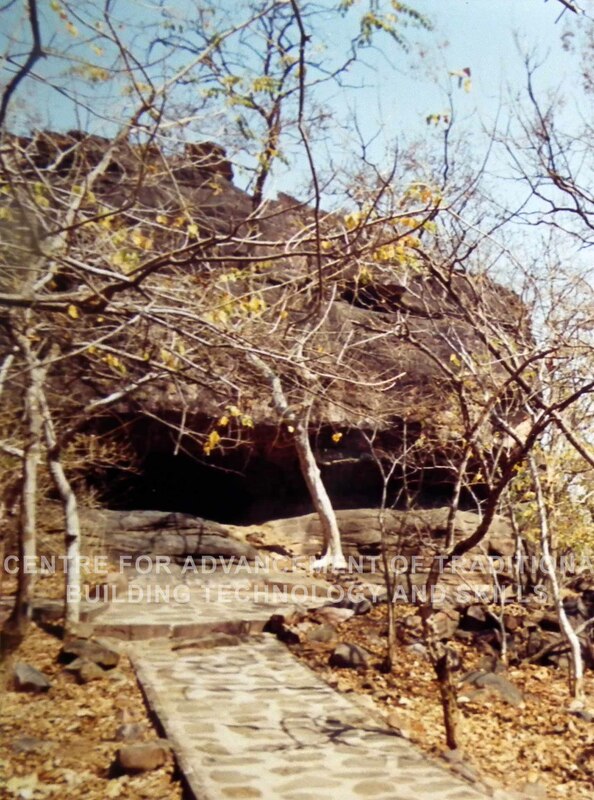 In 1957, Indian archaeologist VS Wakanker discovered more than 700 cave shelters with paintings in a rocky sandstone ridge near Bhimbetka village, surrounded by thick deciduous forests. The rock paintings at Bhimbetka have the same power and energy as the cave paintings in Lascaux, France or the Kalahari paintings in Africa. The site was declared a World Heritage Site in 2003. Bhimbetak is literally a gigantic open air art gallery. 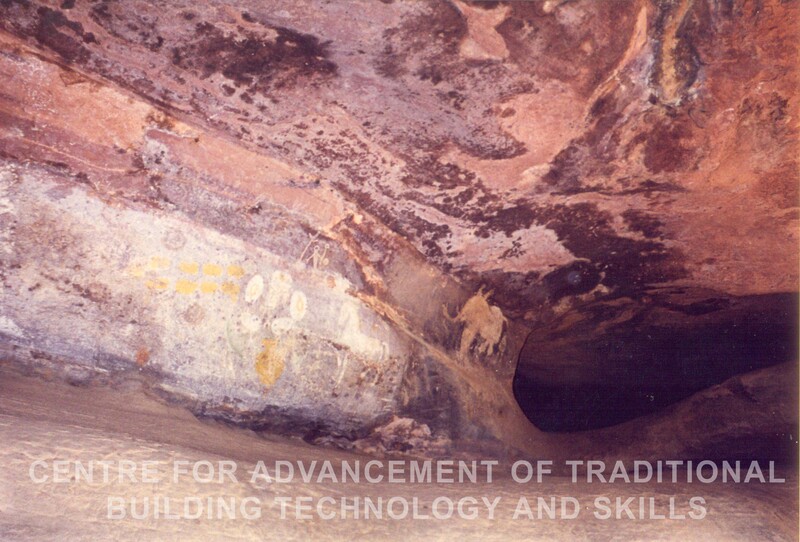 Out of the 700 rock shelters at Bhimbetka, over 400 have paintings. The oldest and the largest number of paintings belong to the Mesolithic phase (8000-5000 B.C.) of the Stone Age. The Mesolithic artists of Bhimbetka knew as many as 21 colours. Their favourite colours however were white and red. The paints were made by grinding rocks and minerals and then mixing the powder with a medium such as water, animal fat, gum or resin. The prehistoric painters at Bhimbetka made pictures of animals in great detail especially hunting scenes. They painted a range of animals like the bison, the rhino, buffaloes, monkeys, rabbit, panthers, tigers, deers and curiously, a giraffe. They also loved to paint men, women and yes, children too, running, jumping and playing of course. They sometimes painted people dancing to the tunes of a drummer, gathering food, grinding and preparing food. They also painted masked men and men wearing animal head-dresses, who seem to be either chiefs or priests. 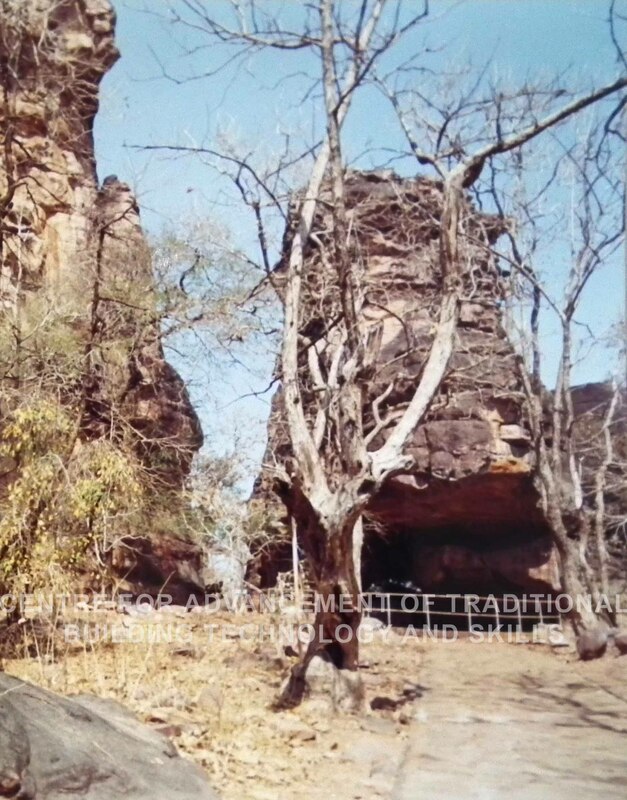 Later caves (1st century A.D.) at Bhimbetka show battle scenes and some Hindu deities as well. Just like little toddlers, pre historic painters also loved finger painting. Many rock shelters also have hand-prints, fist prints and dots made by finger tips. Even today in many parts of India there are traditions of making paintings on walls and even floor like madhubani, mandana, warli, rangoli, alpana, etc. Curiously enough pre historic painters did not mind painting over the older ones. At Bhimbetka, in some places there are as many as 20 layers of paintings. The practice of art, whatever its purpose, gave pre historic people a means of expression, a means of depiction of the trials and tribulations of life as also its celebration, as it continues to do even today. 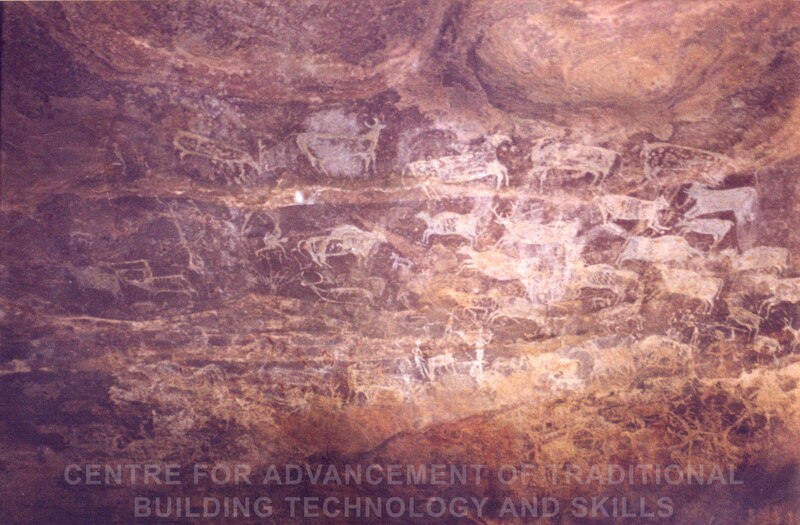 Some interesting photographs of cave paintings inside the caves of Bhimbetka . . . showing a large congregation of animals deer, cow, horse, elephant and human beings . . . see if you can spot some more in the pictures ! Ownership of copyright to text, image and video in a contribution rests with the author. © Unauthorized use and/or duplication of this material without express and written permission from the administrator of the site is strictly prohibited. Excerpts and links may be used, provided that full and clear credit is given to India Heritage Hub with appropriate and specific direction to the original content.